Rio’s Dance is an augmented reality DDR game that features Samba dancing. For Rio’s Blu-ray and DVD release, Fox wanted to ‘bring the party home’ and appeal to younger audiences through interactive gameplay. The result was an augmented reality game that allowed users to clap their hands and dance to Samba. Players are judged by how well they synchronize movement with visual cues that appear on screen in-sync with the music. User motion is tracked via webcam. 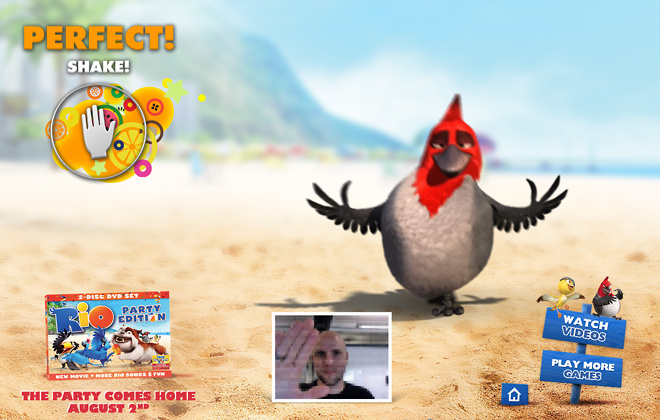 The camera also captured candid moments of the user during gameplay, which produced a number of shareable screenshots for users to share on Facebook. I managed the entire project and delivered the final game on time under budget. This involved re-purposing a game developed for the theatrical site and adding creative elements to convey more of a party theme without compromising performance of the game. Film sequences and confetti animated while movie soundtracks used for the game were altered to increase user engagement.